You may wish to get en overview of tracked changes (revisions) in a document. You can print the changes by selecting List of Markup in the Print What field in the Print dialog box. However, you may want the overview in electronic form. 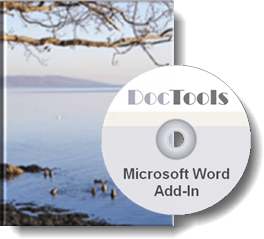 Here you will find both a macro, and introduction to an advanced Word add-in and a free Word add-in that let you extract the tracked changes to a new document. Note that only insertions and deletions will be included whereas other types of changes (formatting changes etc.) will be skipped. Also note that the macro and the free add-in will only include insertions and deletions found in the main body of the document whereas the advanced add-in will also include insertions and deletions found in headers, footers, footnotes and endnotes. Instead of installing the macro available via this page you may be interested in one of the ready-to-use add-ins, DocTools ExtractChanges Pro or DocTools ExtractData. Below, you can read about both the add-ins and the macro. 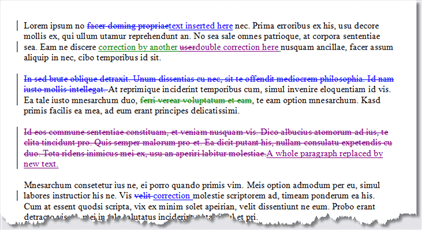 DocTools ExtractChanges Pro is an advanced Word add-in that lets you extract insertions, deletions and comments in full context and including headings and subheadings. The add-in lets you quickly and easily extract data to a new document. The data, incl. additional metadata, will be listed in a table for easy overview. DocTools ExtractChanges Pro is the perfect, time-saving tool for anyone who is editing large contracts and similar documents. This advanced add-in is not free but the return on investment is almost immediate. Save hours of work already on the first use. Click the button below to learn more about DocTools ExtractChanges Pro or to buy the add-in. You can try DocTools ExtractChanges Pro risk-free for 15 days. Read below if you want to use the macro instead of one of the add-ins. Figure 1. Example of a document with changes made by different authors. In this example, the insertions and deletions are shown with underline/strikethrough. However, when running the macro, it does not matter how or whether tracked changes are shown. Figure 2. The tracked changes from the example in Figure 1 have been extracted to a new document. If a footnote or endnote reference has been inserted or deleted, the text "[footnote reference]" or "[endnote reference]" will be shown where such reference was found. In order to make it easy to distinguish between deletions and insertions, inserted text will be applied black font color whereas deleted text will be applied red font color. You can create a PDF file that contains the tracked changes. The layout and contents of the PDF file will correspond to the version you can print on paper by selecting "List of Markup" in the "Print What" field in the Print dialog box. In order to print to PDF instead of paper, you need to select the installed PDF printer (e.g. "Adobe PDF") in the Print dialog box. Note that the exact look of the printed tracked changes depends on your currently selected options for tracked changes. You may also be interested in MVP Shauna Kelly's article How does Track Changes in Microsoft Word work?.